This leaflets design project succeeded at nurturing United Utilities’ relationship with their customers thanks to memorable design and engaging copy. Staying in touch with residents local to United Utilities’ infrastructure maintenance programmes is vital to the success of our client’s projects. The company prides itself on ensuring that residents are made aware of the works being carried out and the potential areas for disruption to their day to day lives. They asked us to produce an engaging and informative leaflets design they could distribute to residents in the area. This would help them demonstrate their commitment to customer service. A simple design leaves room for a prominent headline and a playful illustration that speak directly to customers, and immediately transmit the message our client is trying to communicate. Included in the leaflets are bespoke illustrated maps and diagrams detailing changes to traffic routes, and times and area where the work will occur. We have helped United Utilities keep their customers informed across a wide range of projects over the years. 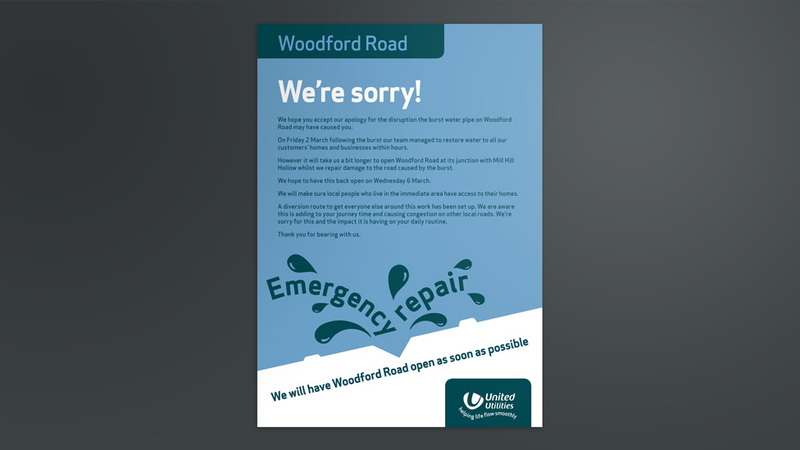 Flyer designs that helped United Utilities communicate with their customers in an engaging and timely manner. To attract a sophisticated audience of wine lovers to an exclusive wine tasting experience, we produced an event flyer design that had visitors flocking.